Bob was in the market for a new camera when he turned to his Google Plus community for answers. He'd compiled a list of a few of the review sites he normally consulted and wanted to know if we had any suggestions. Great question. With so many options for a new camera or lens, it's hard to know where to get reliable advice. 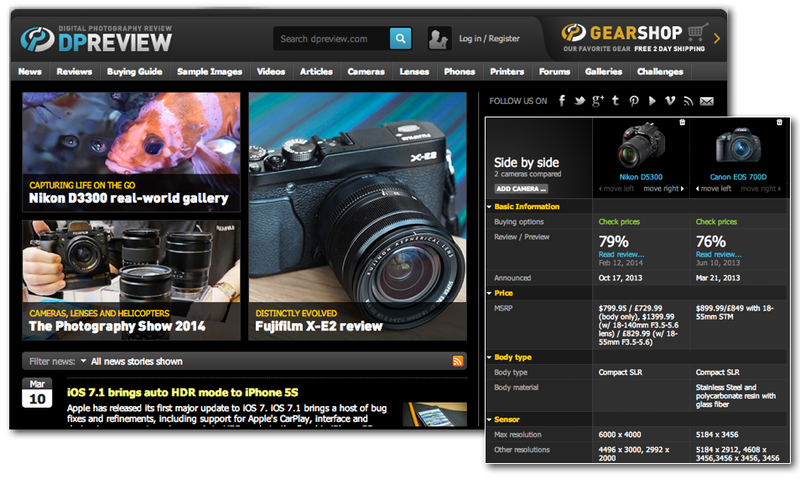 Here are nine sites I regularly check when I want a camera review I can trust. CameraLabs - Is another great source for in-depth reviews. Reviews are long and detailed -- some running almost 15,000 words with plenty of example photos for each. Camera Labs' brainchild, Gordon Laing says his reviews take two to four weeks to complete. If you can read his analysis from start to finish, you will appreciate his thoroughness. Check him out when you are in encyclopedia mode. CNET - I don't typically go to overall tech sites for photography information, because I'm not a fan of the mile wide - inch deep approach. CNET is an exception, however. They have a fairly good library of camera reviews -- both written and video. While CNET is a well-established technology publication, their reviewers always use a personal approach. You know why the individual didn't like the lens; it's a nice touch. The other thing that I appreciate is that they focus just as much on quality-of-life features -- how the buttons feel and work -- as they do on the technical specs. Too many reviewers get lost in technical nuance and ignore the important considerations like "this feels cool." DigitalRev - DigitalRev TV creates some of the most entertaining and irreverent camera reviews I've seen. You might want to keep the volume down at the office, as the host is known to drop some salty language on occasion. The reviews are always fun and don't take themselves too seriously. They also do a lot of this camera vs that camera analysis. If you can't decide between two different models, I'm guessing they've done a comparison video for it. DPReview - This is one of my first stops for camera research. I trust DPReview for in-depth analysis that covers just about every spec that might be important to me. If you like to pore over technical details of your camera purchase, you'll find plenty of data to consider. I also like their side-by-side comparison tool. Choose any combination of the cameras or lenses you are comparing, and create a grid of all their features. Now you can compare apples to apples. FroKnowsPhoto - Fro Knows. Pho-to... (that's how he says it) Jared Polin creates a lot of training videos at froknowsphoto.com, but I'm a big fan of his reviews. He shoots his video overviews in a local camera store, then goes out in the field to test the gear, and includes screencasts of him opening and showing his images. Useful and entertaining. Imaging Resource - This is a great site where you can expect rigorous testing. They strike me as the engineers of the camera review space, meaning they will be precise and no frills. You want facts. They got facts. For instance, they brag that they will track metrics like shutter delay, shot-to-shot cycle times and battery consumption rates. Their emails are dense with information and few pictures, but as I said, if you want facts, they got facts. Ken Rockwell - I enjoy reading Ken Rockwell's site, and that isn't popular to say in some circles. Ken has a very deep database of reviews on just about every camera and lens, going back decades. I've found him to give very clear and useful reviews. There is a school of thought that Ken is biased toward Nikons and can't be trusted. The way I see it, Ken is clearly opinionated, which means you will always make enemies. He is worth a read when you evaluate several sources. 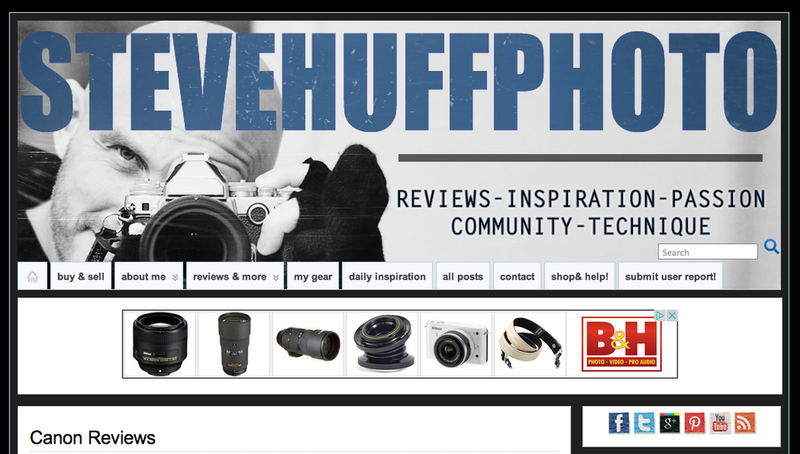 Steve Huff Photo - If you are in the market for a mirrorless camera, you should check out Steve Huff. He is well regarded for that genre, although he still dabbles in some DSLR reviews. 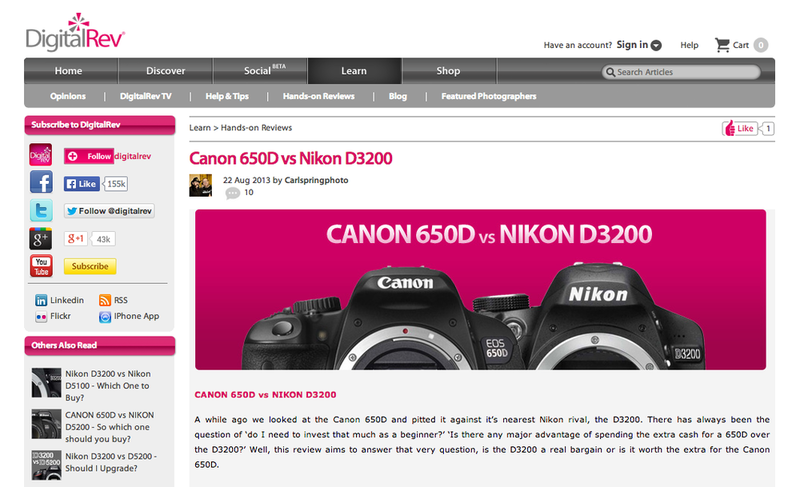 ThomHogan / DSLRbodies.com - The blog title might say DSLR, but Thom Hogan is a well respected Nikon professional. If you are a Nikonian, you want to hear what he thinks about your next camera. His background is all Nikon, but he isn't afraid to take the company to task when he feels it is warranted. Good practical, advice. Outside of these review sites, when you are in research mode, you can also check user reviews at the big camera stores like B&H Photo Video, Adorama, and even Amazon. You might scan them for recurring themes across people who own the gear you are considering. Like any unmoderated comments on the internet, I would not rely too much on any one user's advice. Expect outspoken, oppinionated and sometimes irrational. I find value in the aggregate. If 200 users all say the lens is slow and annoying, take note. Finally, while this post is about finding other photographers' reviews, there is no substitute for your own test drive. Before purchasing any high-priced item, I'd rent it for a weekend and form my own opinion. Sites like lensrentals.com have the added benefit of providing their own reviews. Roger Cicala, president of LensRentals often gives "Roger's Take" -- a short two to three paragraph dish on popular cameras and lenses. We are truly in the information age. There is no excuse for making an uninformed decision about a camera purchase. What are your favorite camera review sites? Have I missed any? Tell me what you think in the comments.